Sunyani (B/A) Dec 9. GNA - Four Ministers of State from Brong Ahafo retained their parliamentary seats, one gained entry while two others failed in their bid to enter the august House. Mr. J. H. Mensah, Senior Minister Mr. Kwadwo Adjei-Darko, Minister of Local Government and Rural Development easily won the Sunyani East and Sunyani West slots respectively. Ms Anna Nyamekye, Deputy Minister of Food and Agriculture also won back the Jaman South seat while Captain Nkrabea Effah-Dartey, Deputy Minister of Local Government and Rural Development retained his Berekum seat. 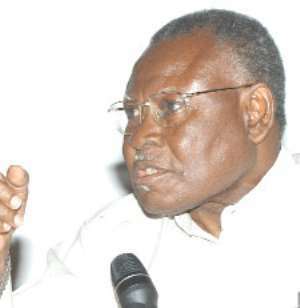 Mr. Ernest Akubour Debrah, Northern Regional Minister grabbed the Tano North seat. Mr. Thomas Broni, Deputy Minister of Interior slipped in his attempt to wrest the Asutifi South seat whilst Professor Christopher Ameyaw Akumfi, Minister of Railways, Ports and Harbours lost his way to the Techiman North seat. The DCE for Nkoranza, Mr. Kwame Amporfo-Twumasi, popularly known as "Abodwese" easily grabbed the Nkoranza South slot, as according to the certified results released by the Brong Ahafo regional office of the Electoral Commission. He received 17,655 votes as the electorate in the constituency could be said to have voted along the "skirt and blouse" pattern. NPP lost to the NDC in the Presidential election. Mr. James Opoku Worae, NDC Parliamentary candidate in the constituency had 15,521 votes, while Mr. Boah Victor of Democratic People's Party (DPP) had 337 with 761 of the total valid votes of 33,513, rejected. In the Jaman North Constituency, Mr. Asum-Ahensah Alexander (NDC) had 12,027 to obtain the ticket to Parliament and was followed by Dr. Kofi Oti Adinkrah (NPP) with 10,424 and Mr. Twene Aduasare Kwasi (CPP), 437. 209 votes were rejected out of the total valid ones of 22,888. In Jaman South Constituency Ms. Anna Nyamekye (NPP) retained her seat winning with 17,802 votes, Mr. Ahmed Shams Dinu (NDC) had 12,085, Mr. Osei Koranteng (PNC), 782, Mr. Oteng Agyemang (CPP), 337 and Mr. Oppong Kwabena Martin (DPP), 173. Mr. Yaw Ntow-Ababio of NPP won the Dormaa East Constituency with 11,533 votes, Mr. Nicholas Kwabena Agyei Kyeremeh (NDC) had 7,539, Mr. Asante Oppong Alexander (CPP) 571, and Lovea Amponsah (DPP) 197. Dormaa West Constituency was also captured by NPP as Mr. Yaw Asiedu Mensah collected 23,764 votes, followed by Mr. Oppong Asamoah Vincent (NDC), 22,601 and Mr. Kwadwo Agyei Dwomor (DPP), 1047. Mr. Ernest Akobuor Debrah, Northern Regional Minister triumphed in Tano North with 15,868 votes to beat NDC's Mr. Charles Appiagyei who had 10,253, Ms. Florence Nyamekye (DPP), 485 and Mr. Daniel Kwadwo Kyeremeh (CPP), 167.